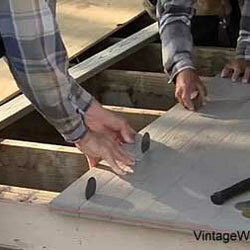 Installing porch flooring is something almost anyone can do given the right instructions and basic tools. Mary and I are excited to bring you the best flooring installation instructions we could find. 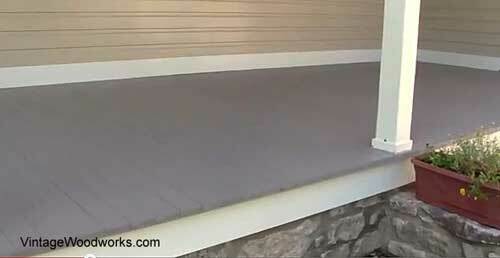 Vintage Woodworks, producers of porch products since 1978, have kindly allowed us to share their porch flooring installation video series with you. 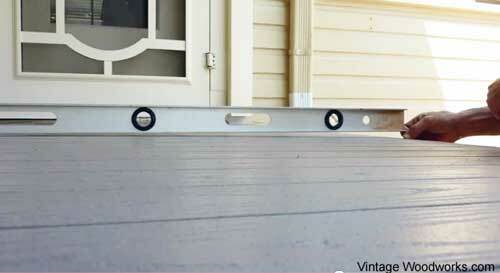 Learn more about Vintage Woodworks and the vintage porch parts they offer. 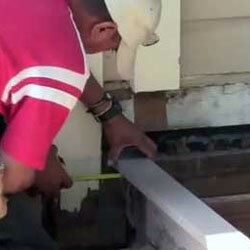 These instructional videos walk you through the steps and give you advice from selecting the materials to installing porch boards and setting posts. This video series cover specific problems with replacing old flooring on a wrap-around porch, solutions they employed, and the actual installation of their new floor. In Part 1 of our porch flooring installation series, Gregory, owner of Vintage Woodworks, begins by resolving issues with the existing porch in preparation for installing new porch boards. We are also including the video transcript here so you can refer to the instructions and information at your own pace. Hi! I'm Gregory with Vintage Woodworks. Since 1978 we've produced items for porches. Recently my wife and I decided to replace the wood flooring on our farmhouse with something more permanent. Something that didn't require painting - not at first, not ever. This video series covers the problems our old flooring had, the solutions we employed and the actual installation of our new floor. It is purposefully detailed and intended for those who wish to achieve professional results even if you're not a carpenter. 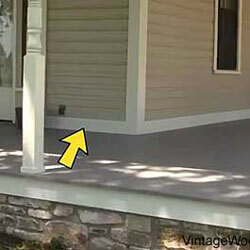 If your porch is newly built, many of our solutions may still be very helpful. We wanted our new floor to be scratch and stain resistant and we wanted to use tongue and groove boards that could be installed with hidden screws. We were tired of having to reset nails that had partially worked out. Finally we wanted our new porch floor to look like painted wood so it would be in keeping with our old farmhouse. We knew we didn't want to use any of the composite floorings found in home improvement centers as these are made of wood fiber and some sort of binder. They are prone to scratching and unsightly staining. Gregory goes on to say: "For us the perfect choice was one of AZEK building products, specifically, AZEK Brand Cellular PVC Porch Floor Boards sold by Vintage Woodworks. They are made of cellular PVC and with no wood fiber and are so scratch and stain resistant that AZEK and Vintage Woodworks invite prospective customers to test samples against composite floorings. Even the edges look like wood because they are cut with the same saws that one uses to cut wood. And they last just about forever because they don't rot and insects won't chew on them. The color is made in and goes all the way through the material. They come in gray and a warm brownstone. We chose gray because that's such a traditional color for porch flooring." 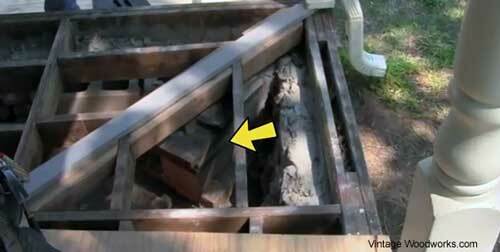 We knew our old porch was out of square and it drooped at the corners due to foundation problems. 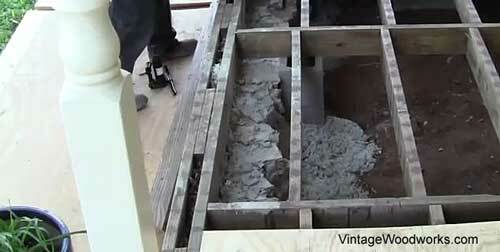 The stone underpinning was loose and learning forward in several places. We easily solved these existing problems and created a porch floor that looks perfect. We started by removing the baseboards along the walls of the house and stored them out of the way. We also removed the old wood flooring and inspected the existing substructure to be sure all joists, including all outer rim joists and cross blocking were sound. 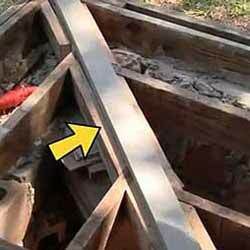 Luckily they are made of pressure treated lumber and are in good shape. We also determined that there was adequate cross blocking. 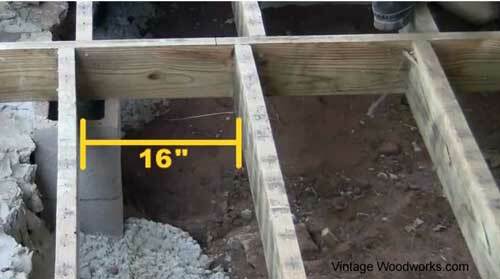 A maximum installation of 16" on center is required for proper installation. The stone masons rebuilt the foundation piers at the corners just behind the visible stonework as these corners had sagged badly in recent years due to inadequate footings for these piers. Using a small jack to lift the corner joists, they reset the corners of the porch to the correct height being sure to include the proper back to front slope that had been built in to the original structure. That's important because without a slight slope from back to front blowing rain will stand on the porch. 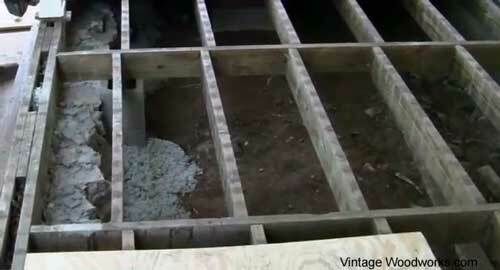 The stone underpinning had been added to the porch after it was built. Because it was never intended to actually support the outer rim joists it was built as a thin one-sided wall. Unfortunately, it was also built on an inadequate concrete footing. Over time it had leaned forward in several places enough to be unsightly. The masons reworked the offending portions. Then to stabilize and strengthen the underpinning, the masons dug a trench on the backside of the stonework and poured a proper steel reinforced footing just behind the existing wall. And then they built a very quick and rough inside face using concrete block for much of it. They were careful to tie the jagged back of the old wall to the new inside face with lots of mortar. With the foundation and stone underpinning strengthened, we are almost ready to install the new porch floor, but there are several things we need to consider first which we cover in the Porch Floor Installation - Part 2.